There are lot of cabbages out there lately, those spring cabbages are tender and yummy especially when in season. I use cabbage often, for soups, salads, to saute and steam, to make a Japanese style pan cake ( Okonomi-Yaki ), rolled cabbage...etc. 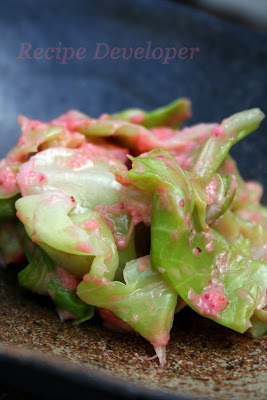 I created a strawberry dressing and tossed with steamed cabbage. The dressing was so delicious it gives you that fresh spring feeling. I have tried this dressing with broccoli, celery, and carrots and it was good, too. The consistency of the sauce is pretty thick, so it's good as a dipping sauce also. Direction: Put all ingredients into a food processor and mix until combined well, that's it!